I’m a big fan of the map work found at Dyson’s Dodecahedron . You can find Dyson’s art on DriveThruRPG or by simply doing a google image search, but the blog is a worthwhile starting point and generally everything’s a gift to gamers. I like Dyson’s style and whenever I’m in a pinch for a map when I get called upon to DM an impromptu game, that’s my go to source. I’ve not shown off my of my map-making in a while. This is a “prop” made up for our ongoing home-brewed campaign set in Drakkarsys. I invested about two hours in this, updating the continent map as a wee bit of treasure found in a dragon’s lair, showing the current state of politics for the region. Welcome to the Republic of Tororagar, located on the Island of Drakkarsys, west of Albatheos. 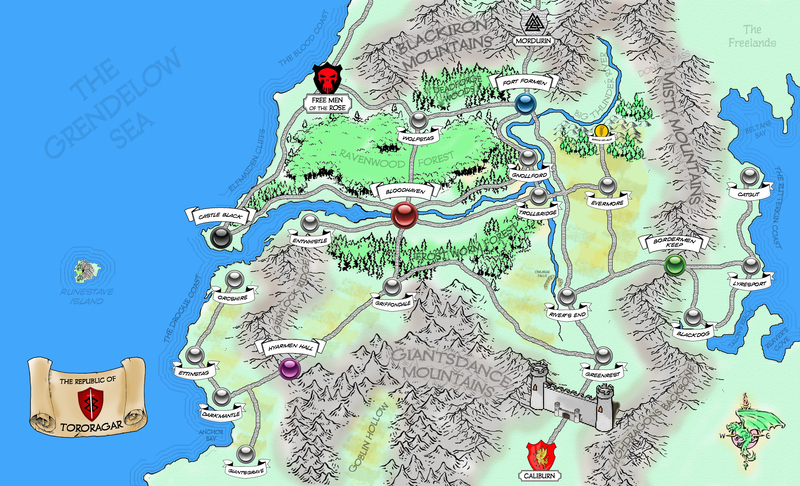 It’s where the characters helmed by the Oak Hill Dungeons & Dragons Club are kicking about… and have been since we started out 5th Edition Campaign. The world has gone through a lot of changes, and so have we.